McCall Pattern Company released their Autumn catalog today. I generally prefer Vogue and Butterick to McCall designs, and this season is no different (with one or two notable exceptions). Other than the fact that the model looks incredibly uncomfortable wearing a hat and gloves, this vintage reproduction design is wonderful! I have never seen a neckline like this on any 1940s dress, but I like it. I never know what to expect with The Archive Collection. It has only been around for two years, and the decades covered since its introduction already include the 1920s through the 1970s, so it is a little bit all over the place. The styles are very hit and miss for me. This one is a definite hit. Just ignore the styling on this one because the pattern has a whole lot of potential. And I know that I sound like a broken record, but I really wish that McCalls would include the original vintage illustrations with these patterns . . .
Then there is McCalls 7431. I cannot say exactly why I am drawn to this design, but I am. It is certainly not the color of the fabric. Perhaps it’s the model? Which may, in fact, be the answer because the only other new design that is grabbing my attention is this twisted knit, worn by the same model. This one is also not at all my style. Maybe the stunning blue color is drawing me in. The one thing that I consistently do not like about knit dresses is the fact that so many of them have such boring back pieces, and this one has that very issue. The front, however, may have enough interest to make it worth my while. And, once again, I have found more patterns to add to the stash (which is definitely out of control at this point). I too am drawn to the Laura Ashley dress for some reason. I think it's the flowy as aspect. Not to psewco-analyze you, but your draw to the Laura Ashley pattern is likely the sleeves, stemming from teen angst of not being the resident "Earth mother" in the high school theatre group. The model's center part is a reflection of your current self-understanding (when it's believed by some that a 40s siren side part would do you infinitely more favors; but that not to say that there are right, or wrong, answers. These are all choices, originating in the subconscious, and manifesting in the milieu of the conscious mind ), and your growing, not-so-subtle infatuation, with the styles of the late 60s and early 70s. This "Jan Brady fashion frontier" will likely be your upper-most time boundary, demarcated by either the Arab Oil Embargo or the Movie Annie Hall (should you again venture back into slacks). That you abhor the 80s will be explored in a future session. I see our time is up, and we'll have to schedule your next appointment. I love Laura Ashley dresses. They were so expensive when I was a kid so I'll just have to make my own. Lol. I noticed that twisted knit dress but I think there are other better Vogue patterns if you want that look, and the back looks really awkward.. I think it would be very sloppy in real life. Also that knit they used in the example looks so cheap and shiny. Your choices are the same as mine! I want to make that 40s dress like NOW! It has beautiful details!!! 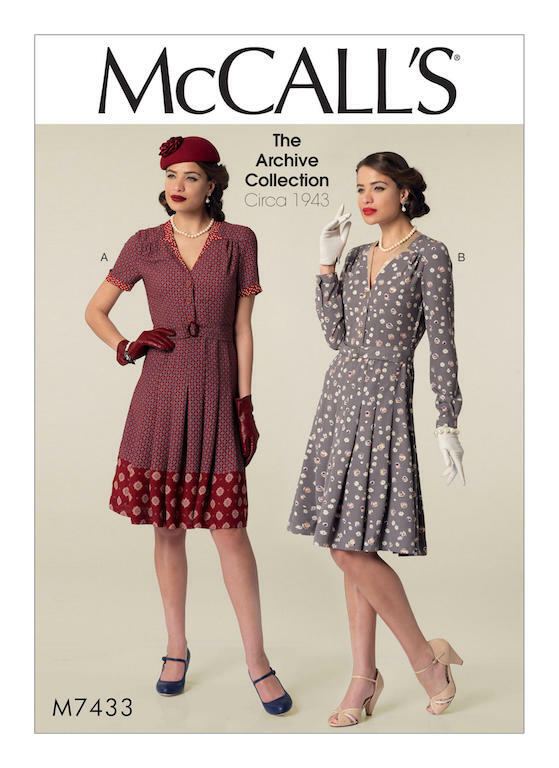 If you check seamracer.wordpress.com you can see her dress made from the original 1940s pattern the reissued first one in this list is made from! It's been altered quite a bit from the original. Just to let you know, I have an original pattern that the McCall's #7433 is based off of. Again, they did changes to the vintage design. If you would like to see the pattern cover and original line drawing, I just did a post about it on my blog. I just ordered #7433. I love the collar.